The American (or pine) marten is a predator (meat eater) species that belongs to the weasel family. 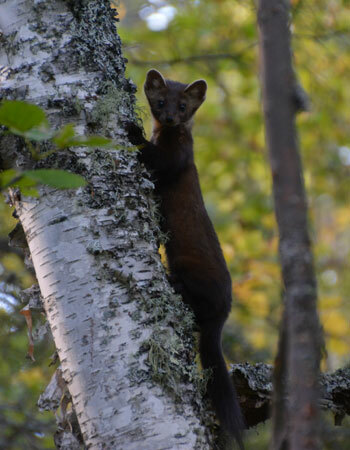 Before the late 1800s, the marten was common in northern Minnesota. Because of logging, most of its wooded habitat was lost. By 1920 pine martens had almost disappeared from Minnesota. The full recovery of the population by 1990 is a DNR management success story. General description: A small predator with golden brown fur and a yellow chest. Its long body and small rounded ears make the marten one of the "cutest" predators in Minnesota. Length: 30 to 24 inches, including the tail. Weight: Adults are about 2 pounds. The males are slightly larger than the females. Color: Brown, tinted with gold or yellow. Martens are pregnant for about nine months, but the fetus only develops during the last two months. The litter of two or three babies, called kits, is usually born in a hollow log or under bushes. Martens eat mice, chipmunks, red squirrels, and insects. During summer, they also eat berries and nuts. During winter when there is deep snow, martens hunt under the snow in tunnels. Fishers, bobcats, and a wide variety of hawks and owls will all kill martens. Some people trap them for their fur. Martens were once thought to live only in old conifer (evergreen) forests. But now biologists have learned that martens now live in all of northern Minnesota in both deciduous (leafy) and conifer forests that are young and old. Adult martens live in an area of about two to four square miles. 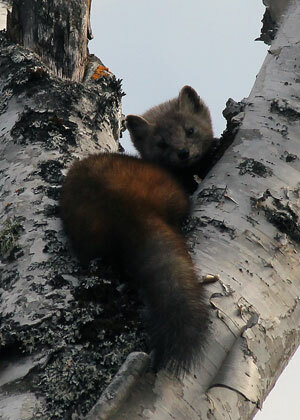 As late as the 1950s, the marten was thought to be extinct in Minnesota. But then a growing number began showing up and by 1985 the population was large enough that Minnesota could have a limited trapping season. By 2001, the population had grown to more than 10,000 martens, and the animal continues to spread south and west. During cold weather, martens have a hard time keeping warm, so they tunnel deep under the snow into tangles of tree roots for warmth. Martens often visit bird feeders during winter to hunt the birds that visit the feeders.